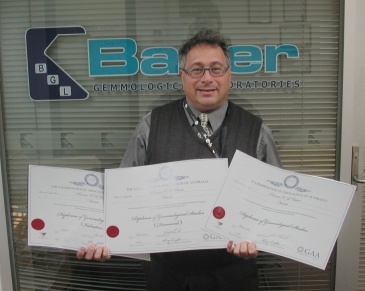 Ronnie Bauer, the current Federal Chairman of the GAA has just been awarded the Association’s only Diploma in Gemmology (Diamonds). At the same time he also was awarded the Association’s accredited Diploma in Gemmology and Diploma in Gemmology (valuations). “I feel very honoured to be the first and currently the only recipient of the Diploma in Gemmology (Diamonds).” Said Ronnie, “ But that’s it! At 53 I don’t want to do any more exams.” That statement however was short lived. Ronnie revealed in the next breath that he has enrolled in the GAA’s jewellery sketching and design courses. For further information please call Klepner’s Jewellers/BAUER Gemmological Laboratories on (03) 96541501 or (03) 96022758. Above: Ronnie Bauer with three diplomas. This entry was written by Nikhil Jogia and was posted on on Thursday, June 11th, 2009 at 6:43 pm	and is filed under Diamond Industry. You can follow any responses to this entry through the RSS 2.0 feed. You can leave a response, or trackback from your own site.